The case for a flexible work schedule for faculty has been repeatedly made, with one policy recommendation being part-time positions for tenure-track/tenured faculty (PTTT). Despite some of the benefits of this approach for both faculty and institutions, the PTTT concept is the least implemented policy for faculty flexibility and is poorly understood. This report offers the first comprehensive treatment of PTTT, suggesting that this mode of flexibility enhances recruitment, retention, and engagement of faculty, while offering value-added productivity, planning potential, and faculty loyalty for the institution. This is the 5th issue of the 40th volume of the Jossey-Bass series ASHE Higher Education Report. Each monograph is the definitive analysis of a tough higher education issue, based on thorough research of pertinent literature and institutional experiences. Topics are identified by a national survey. Noted practitioners and scholars are then commissioned to write the reports, with experts providing critical reviews of each manuscript before publication. 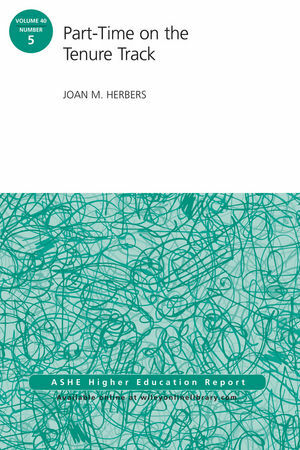 Joan M. Herbers is a professor of evolution, ecology, and organismal biology, and of women's, gender, and sexuality studies at the Ohio State University. Kelly Ward and Lisa E. Wolf-Wendel.